WE MAY NOT BE KILLING women accused of witchcraft today, and we may not condemn people for not going to church, or for not professing faith publicly. Thank God. But Arthur Miller’s classic play The Crucible, focused on the Salem witch trials from over 300 years ago, is still relevant. There are still factions of society that abhor the separation of church and state granted a century after Salem. And similar kinds of mass hysteria generated against a class of people still stir occasionally. In Miller’s day, it was McCarthyism’s defaming of left-leaning Hollywood types. The Keegan Theatre’s production of The Crucible, directed by Susan Marie Rhea, packs a wallop with its large cast of 20, including several child actors. … Also serving as set designer, Keegan’s artistic director Mark A. Rhea deserves praise for his creative use of essentially one set for four acts, making it relatively easy for the cast to get around. 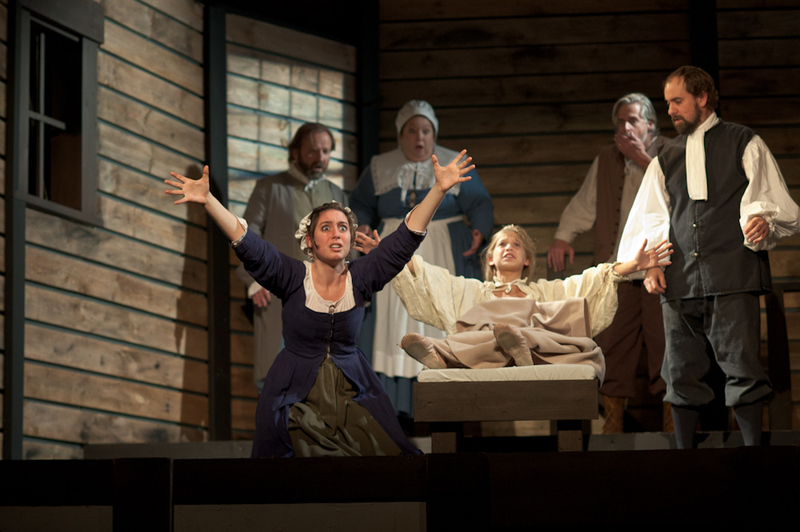 … Karen Novack [gives a] masterful portrayal of Elizabeth Proctor. Stately and stoic, Novack plays Proctor as morally upright but also smart, sophisticated and intelligent. She’s a modern woman – centuries ahead of her time. That naturally scares the bejeezus out of the Puritans, and she becomes a chief target in the anti-witch crusade. The Crucible revolves around her husband, John Proctor, a religious man who’s not above questioning his faith, and who would prefer to practice in private. His efforts to save his wife are complicated by an earlier dalliance with Abigail Williams (the captivating Sarah Lasko), the duplicitous young woman who is helping the court in its fight against witchcraft and Lucifer. 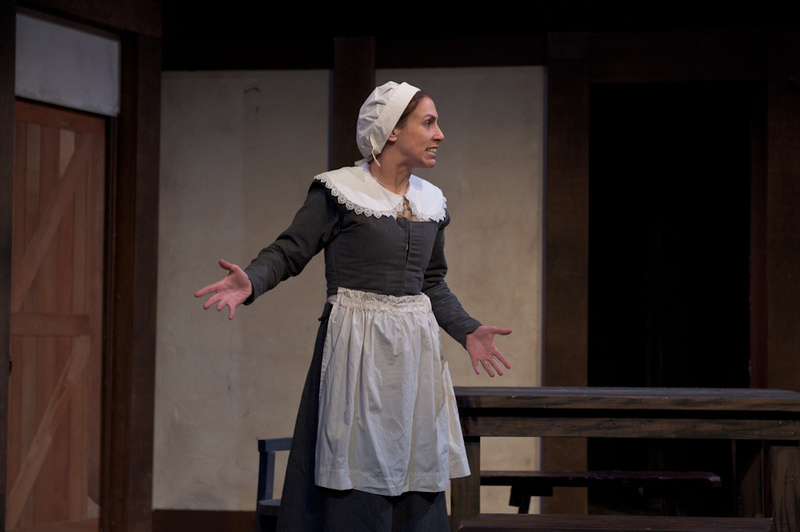 … In addition to Novack and Lasko, Emily Riehl-Bedford also shines in her portrayal of the hysterical Mary Warren. You don’t doubt the awe commanded to Kevin Adams’s Deputy Gov. Danforth, even as you dismay over his unchecked power in the courtroom. And Kevin Hasser makes the Rev. John Hale a conscientious pastor to believe in, wrestling with his faith in humanity.